About the Book Powerfully Recovered! — Powerfully Recovered! I added the bold typeface, but the italics are original. I’m also convinced that the Program is designed to show each one of us how to become Powerfully Recovered! Powerfully Recovered! was written to help you accomplish just that. It is NOT about curing the addiction. I’m in total agreement that abstaining from the substance and/or the behavior is the only solution. It is not intended as a replacement or alternative to AA, NA, OA, DA or any of the myriad of 12 Step programs and groups that continue to be such an effective solution for so many. Nor is it a method of studying the Big Book and/or other 12 Step literature. Perhaps most importantly, Powerfully Recovered! is totally supportive of all 12 Step programs. In fact, the book uses the original source material, Alcoholics Anonymous (The Big Book), The 12 Steps and 12 Traditions (12 and 12) and As Bill Sees It: The AA Way of Life to make it’s case. Powerfully Recovered! identifies two damaging myths that have grown up in the fellowship – the meetings and other settings like coffee after, etc. Those myths, perpetual powerlessness and never ending recovery, prevent countless from stepping full into life as the Program promises. Using the Program as it’s written in the Big Book, the 12 and 12 and drawing on my own experience and the experience of others, Powerfully Recovered! shows you exactly what the myths are, how they developed and what you need to do to let go of them and step into the fullness of life by becoming recovered – powerfully so. Powerfully Recovered! can be used by any 12 Stepper in any 12 Step program. It will ground you in the original intention of the program. You’ll find three reviews at BN.com. There are 11 reviews at Amazon. Fred Ashmore at Mental Help Net seems to like the message but not the writing style. Quality paperback: If you want to buy the book from Amazon, click here or on the book cover at the top of the page. – that will take you to the proper Amazon page. As an ebook – as a .pdf file which is readable by almost everything. If you’re a bookstore, contact me directly and we’ll work it out so you make your profit. Get a sample – the first 25 pages free as a downloadable .pdf file. *Getting an accurate count is easier than it used to be. I downloaded the free version of the Fourth Edition of the Big Book from http://aa.org/lang/en/subpage.cfm?page=359 and used the search feature to count the times recovered is actually used. Here’s a list of the books I used writing Powerfully Recovered! If you find this page helpful, share it with your network – that really helps. Thanks! You can order it through Amazon or any bookseller really. Exciting to hear you say that, Sharon. Keep us posted for sure. And feel free to ask questions… maybe I’ll put up a forum so we can all talk about these issues. What do you think? 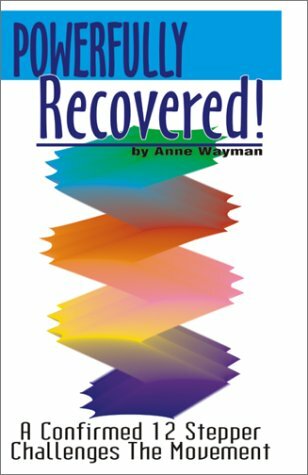 I can’t find a Kindle version of “Powerfully recovered” on Amazon. Will it be going onto ebook or kindle version soon? I’m a beginner to 12-Step. I’ve been to one AA meeting here in Australia and been dry for over 10 weeks. I’m reading the Big Book, Little Red Book, 24 Hrs a Day, meditating etc and it seems to helping. I’ve been self directing the 12 steps and gone up to Step 9. I’m not racing to an end point and realize its a life journey. I see the Steps as a simple way of living a spiritual life and can be done inside or outside of a program and with or without meetings, its a daily thing. I don’t subscribe to religion but have found my peace with a Higher Power thanks to this AA philosophy as Bill W and Dr Bob intended it to be. I’m reluctant to go to AA meetings as I feel that recovery, like spiritual growth is a personal journey. We can look for guidance but not have our growth piloted by someone else. All the AA literature I’ve read encourages this inward “taking charge” approach and finding strength, hope and resolve in a Higher Power. I don’t want to go to meetings and be told we are hopeless and powerless and forever “stuck” in our addiction and cannot move beyond it without going to weekly meetings. I’ve found a lot of literature out there highly critical of the modern AA approach of keeping people in a rut and dependent on AA. Its like AA puts itself first on peoples list of priorities, instead of the Higher Power and Sobriety. This is dangerously close to a religion or cult in my view and contradicts the Big Book and the intent of the founders. Incidentally my father was an alcoholic, went sober for 10 years thanks to psychotherapy, court orders and other modalities and eventually went back to the drink. He went skid row and I never saw him again. After 26 years I learnt that the booze had killed him. I’m sure 12 Steps would have cured him and his underlying anger and depression issues as it appears to be doing for me. All you need is faith in yourself and in your Higher Power. My one concern if attending AA meetings and coming to the conclusion “this is shite, I’m out of here” because it encourages a defeatist attitude leaving me feeling let down, isolated, depressed and needing a drink. John, congrats on 10 weeks! I’m hoping to get it on kindle soon, but I can’t give you a date. If you buy the ebook version you’ll get a pdf and you can put that on your kindle as a personal document… pdfs on kindles won’t let you expand the type, but they’re still pretty readable. Turns out formatting for kindle is not trivial. Not all meetings focus on perpetual powerlessness – you might want to experiment and try going two or three times to several meetings and see if any of them suit you. There can be amazing differences between meetings. While I agree that a spiritual path/awakening/enlightenment is indeed personal, there can also be great value in not going it entirely alone. http://aa.org/pdf/products/f-59_gso-ctroffoverseas.pdf is a link to a doc. that shows, among other things, the Australian Central office – that’s one place to get meeting info should you want it. Not so by-the-way, we in AA don’t use the word ‘cure.’ I’m still an alcoholic even though I haven’t taken or wanted a drink in years. I strongly suspect I would fall back into drunkenness even after all this time if I drank again and I’m flat not willing to risk it. Your father’s experience simply verifies that for me. Thanks for sharing that story. Stay in touch if you like. One can never be “cured” of alcoholism. I’ve accepted I can never drink again and have handed that right over to my Higher Power. Three months ago my 8 year old son asked why I drink so much beer. I responded that I was entitled to it and had earned the right to drink. Today I say that I’ve lost that license for life and will not risk that first drink. I’m taking it one day at a time. Its actually getting harder now after the initial euphoria of realizing I was on a life changing journey. I’m grateful for your response and will attend AA meetings because I see the value in sharing with and learning from others. I’ve read enough to see that it must work. I wish my old man had found AA. He took to gambling straight after coming out of rehab and was often angry. I remember thinking he had been a lot nicer when he was drinking. With AA behind him, it may have been different. I have the Big Book 4 ed on pdf on my Kindle and if you read it in landscape its fine. Whats the link to where I can buy the pdf to your book. I like to keep all my 12 -Step material handy on my Kindle as I travel a lot. Thanks again. I think you should start a forum.